Cooler temperatures, colored leaves, pumpkin patch visits, apple cider and best of all Halloween! We couldn’t let this month go by with out a few tips on managing the onslaught of candy and goodies during this month. The ADA has a wonderful article full of tips and suggestions we are passing on to you! “Tooth decay is five times more prevalent than asthma and results in more than 51 million hours of missed school each year,” said Dr. William Calnon, president of the ADA. 1. Offer healthy alternatives to candy. 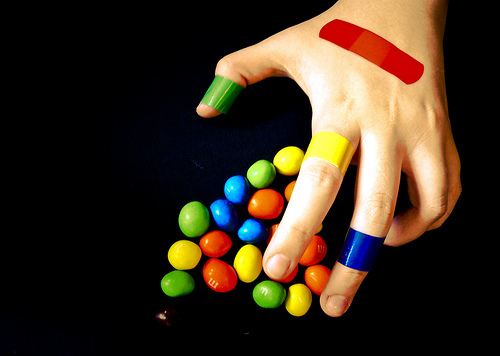 Eating sweets causes damaging acids to form in the mouth. These acids continue to affect the teeth for at least 20 minutes before they are neutralized. Sugar-free gum containing the artificial sweetener xylitol is effective in combating the bacteria in plaque and fighting the acid that eats away at enamel. The chewing motion also stimulates the flow of saliva, which helps cleanse the teeth. That makes sugar-free gum a smart choice to drop into Halloween bags. 2. Limit the amount of time that sugar is in contact with your child’s teeth. When buying candy for Halloween, look for treats that can be eaten quickly, like miniature candy bars. When you get home from trick-or-treating, discard hard or sticky candies like sugared fruit snacks, caramels or lollipops, as they increase the period of time in which teeth are exposed to sugar. Encourage your child to eat a small amount of candy in one sitting followed by a glass of water and thorough tooth brushing. It is not a good idea to allow your child to graze on candy as this will increase the amount of time sugar comes in contact with teeth. 3. Teach your child to eat all foods in moderation. Although sweets are blamed for much tooth decay, all foods — even healthy alternatives to candy, such as fruit and nuts — can promote tooth decay if eaten in excess. Children (like adults) should eat all foods in moderation. Read nutrition labels to avoid foods and drinks loaded with sugar, fructose and other sweeteners. 4. Set up a candy bank. Allow your child to make daily withdrawals from the bank and monitor the progress. This way, you can control how much candy your child consumes. 5. Take time during Halloween to brush up on your child’s oral health habits. What better time than Halloween to treat your kids to a little reminder about the importance of healthy teeth and gums? Just a quick reminder of the importance of brushing, flossing and visiting the dentist is all that’s needed to help your child understand the importance of oral health. Treat your child to a special, new toothbrush and some flavored floss to reinforce the habit of proper dental care. 6. Use fluoride to fight cavities. The use of fluoride has been demonstrated to dramatically reduce the damage caused by tooth decay. The most common ways to use fluoride for cavity prevention are by using fluoridated toothpaste and other products and by drinking fluoridated water. Children should brush at least twice a day for two minutes with a small (pea-sized) amount of fluoridated toothpaste and rinse with a fluoridated mouth rinse. Fluoride treatments, applied directly onto teeth, are also available in any dentist’s office. Fluoridated water generally is delivered through a community’s water supply. If your area does not have fluoridated water, consider buying fluoridated bottled water or asking your dentist for fluoride supplements for your children. BACK TO SCHOOL…WITH NO CAVITIES !!! Time to go back to school!!! The day has finally arrived for all parents to rejoice with the kids going back to school. Yet, back to school also means back to schedules, early mornings rushing out the door, and having to think about lunch and snack options. We do see an increase in gingivitis and cavities during the summer months. This is often due to floss going on vacation when you and the kids are sipping sweet tea and lemonade on those lazy hazy days of summer. The school season brings it’s own challenges for your oral health. So how do you keep your teeth and gums healthy during hectic school and after school activities? First lets talk about how quickly plaque forms and why it is so important to have a twice a day oral health routine for the whole family. The name of the game here is “Defeat Plaque”. This sounds corny but this is your motivation. Plaque begins to form within minutes after you brush. It starts out as a positive reservoir for fluoride, calcium and phosphate deposits. These strengthen the teeth and protect the teeth from cavities. The down side of plaque is within a few hours the good bacteria turns into bad bacteria collecting carbohydrates that turn into acid. What is a parent to do? Encouraging brushing in the morning is challenging but important. Listerine swishing for your teenager before school is better than doing nothing, but not a substitute for the toothbrush. Check out Listerine Zero for a non-alcohol solution. (Stop by our office for $1 off coupons.) Listerine has the best research with evidence to prove Listerine does what is claims to do. Packing lunches is a tough one for those picky eaters. Try to avoid sticky additions to their lunch like fruit snacks. Apples are a great lunch item because they are crunchy and can help with plaque removal. Try to stress the need for a big swish of water after lunch. This will dilute the carbohydrates and give the teeth a little fluoride to combat the acid attack. If snacking after school is unavoidable encourage water swishing and drinking while snacking. Discourage soda, sports drinks, energy drinks, chocolate milk and some flavored water. Speaking of the drinks our kids consume; I have listed a few examples of some popular drinks and their acid content. Feel free to contact our office for a larger list of beverages; the pH, teaspoons of sugar, and grams of sugar per serving. 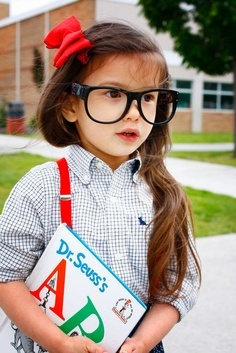 “Give me an N, give me an O, give me a C, give me an A, give me a V, give me an I, give me a TIES. What does it spell? Summer is officially here! Time for the pool, beach, summer camps and ice cream! Children, teenagers and college students are ready for a break and parents are planning well deserved summer vacations. Summer is also a great time to catch up on your dental appointments. Have you had your 6 month check up? Is it time to take care of that filling Dr. Anderson recommended? How about getting started on Invisalign? Brighten your summer with teeth whitening! The demands of school, extracurricular activities and work absorb much of our time during the year. Check your calendars, come and see Dr. Anderson, Gail, Charlotte, Tammy, Kristin and Peggy. We will be sure to entertain you and provide you with an enjoyable dental experience. Show the World Your Most Beautiful Smile! This is the headliner for the new Venus White Teeth Whitening System. Why should you consider whitening when you think your teeth are just fine the way they are and finances have yet to rebound to where they once were? My teeth are too sensitive. My teeth are not “that” bad. I don’t have the time to fuss with it. I can’t go through the impression procedure to make the trays. The reasons why people should reconsider why they should whiten their teeth? There are 3 different methods to try each with a reasonable fee. Venus White is almost half the fee from previous whitening systems. Everyone benefits from a brighter smile whether you work with the public or not. A bright smile gives a healthy and “younger” looking appearance. Most people will not even notice your whiter teeth. They will tell you “how rested you look” or “how healthy you look”. The new Venus White system has options starting with 30-45 minutes up to the traditional overnight system. The new in office procedure does not use a “light enhancement” (which has questionable results per the current research) and only takes 1- 1 ½ hours of your time (with a significant fee reduction compared to our previous system). No need for impressions with the Venus White ULTRA. This system includes prefilled trays with a 7 day treatment. For $55 you can have results in one week. Here at Anderson Family Dentistry we are very excited to be offering this new whitening system with expected great results. Affordable, easy, and with minimal sensitivity. The company supplying the Venus White Teeth Whitening System also donates a percentage of every sale of Venus White to support breast cancer research. Log onto www.MyVenusSmile.com for more information on each of the bleaching systems or feel free to call or email our office. Enjoy a brighter smile this spring! Yes, it is that time! Be aware of your remaining dental benefits for 2012 and take advantage of using them now! WHY….. Ask Anderson Family Dentistry to assess the status of your current dental benefits. Inquire about available payment options. We are here to help you obtain optimal dental health!! What is all that “stuff” in my toothpaste? Let’s get down to the nitty gritty of what is in our toothpaste! We hope the following article answers some or all of your questions. Feel free to ask us any other questions you may have the next time you are in our office for a visit. Click on the link below for the full article. Abrasive agents. Scratchy materials, including calcium carbonate and silicates, help remove food, bacteria, and some stains from your teeth. Flavoring. Artificial sweeteners, including saccharin, are often added to toothpaste to make them taste better. While many people equate the flavor of toothpaste with mint, toothpaste is available in a variety of flavors, including cinnamon, lemon-lime, and even bubblegum (for kids — or kids at heart). Humectants for moisture retention. Paste and gel formulations often contain substances like glycerol to prevent the toothpaste from drying out. Thickeners. Agents that add thickness to the toothpaste, including gums and gooey molecules found in some seaweeds, help achieve and maintain proper toothpaste texture. Detergents. Those suds you see when you brush your teeth are from detergents like sodium lauryl sulfate. The most important ingredient to look for when choosing toothpaste is fluoride. Fluoride is a naturally occurring mineral. Its use has been instrumental in the dramatic drop in tooth decay and cavity occurrence that has taken place over the past 50 years. Bacteria in your mouth feed on sugars and starches that remain on your teeth after eating. Fluoride helps protect your teeth from the acid that is released when this happens. It does this in two ways. First, fluoride makes your tooth enamel stronger and less likely to suffer acid damage. Second, it can reverse the early stages of acid damage by remineralizing areas that have started to decay. Using fluoride toothpaste is an important way to ensure that your teeth are reaping the benefits of this dental-friendly mineral. Don’t think you can skip fluoride if you live in an area where the water is fluoridated. Studies have shown that using fluoride toothpaste helps increase the concentration of fluoride in the teeth, even in areas with water supplies containing high levels of the mineral. There are a variety of ingredients used in toothpaste to help prevent the accumulation of tartar on the teeth. Chemical compounds, including pyrophosphates and zinc citrate, are often added and have been proven effective. Additionally, some tartar control toothpastes contain an antibiotic called triclosan, which kills some of the bacteria in the mouth. These toothpastes usually contain potassium nitrate or strontium chloride. These chemical compounds, which can take up to four weeks to offer relief, reduce tooth sensitivity by blocking pathways through the teeth that attach to nerves. Whitening toothpastes do not typically contain bleaches. Instead, they contain abrasive particles or chemicals that effectively polish the teeth or bind to stains and help pull them off the tooth surface. **Note from our office: most whitening toothpastes contain a concentration of hydrogen peroxide or carbamide peroxide. Although you might be concerned that the abrasiveness of whitening toothpaste could damage your teeth, studies suggest that whitening toothpastes are no harder on tooth enamel than other types of toothpaste. Opt for ADA approval. Whatever your toothpaste needs, be sure to select toothpaste that has earned an American Dental Association (ADA) seal of approval. Toothpastes that have earned this distinction have been evaluated for safety and effectiveness by an independent review board of scientific experts. All toothpastes earning the ADA seal contain fluoride — the most important ingredient in any toothpaste. Be wary of imposters. In 2007, some toothpastes imported from China were found to contain a toxic substance, diethylene glycol. The FDA is currently advising against choosing toothpaste that says it was made in China. Consider your needs and the needs of your family members. As long as you select a fluoride-containing toothpaste, the best toothpaste is a matter of personal choice and preference. If you’re committed to an all-natural lifestyle, you may want to opt for ADA-approved toothpastes that contain only natural ingredients. For people trying to instill good oral hygiene habits in your children, why not choose fruit-flavored toothpastes with sparkles to entice them to brush their teeth? Some people are eager to restore whiteness to their teeth with whitening toothpastes. Others like the feeling of brushing their teeth with toothpaste containing hydrogen peroxide or baking soda. With so many different options and combinations available, you can experiment with different brands, varieties, and flavors to find the best toothpaste for you. Summertime, lazy days sipping something deliciously sweet!! Hurray!!! Well, I hate to spoil your fun, but this kind of summer will deliver you, in the fall, to Dr. Anderson’s dental chair to take care of a few cavities! Hydration is critical during these hot summer days. So school’s out, pools are open, the beach is calling your name, what’s a thirsty person to do? Find a favorite summer drink. Take a realistic look at the amount of sugar you are consuming with your beverage of choice. Drink with a meal. (Saliva increases during meals and helps neutralize acid (see our April blog for details on acid content). Limit sugary drinks between meals. This includes sports drinks, juice, and milk shakes. Since the average adult needs 9 – 13 cups of fluids every day, let’s get back to the question of “what is a thirsty person to do?”. If water is just not your cup of tea (or soda), try brewing one of the wonderful flavors of herbal tea found on the grocery store shelves. Make ice tea out of it or ice cubes to flavor your water. Drink sensibly. A straw helps, but following the steps from the ADAis extremely important. Soda does not quench your thirst or rehydrate the body. They are addictive and can increase your thirst. Water is the only thing your body is craving in the heat! Diet soda’s are not always the answer either. They are not a healthy drink alternative and artificial sweeteners have yet to be proven 100% safe. Moderation here is very important! I have listed a few resources below that will give you further details. “Sugar Shockers!” has several wonderful charts with total calories, grams of sugar and teaspoons of sugar. I found this information very useful while researching for this blog. The Results Are In For: Water Pik’s Water Flosser vs Sonicare’s Air Flosser ! The Journal of Clinical Dentistry recently published the results of a study comparing each of these home care aids. The water flosser demonstrated 80% more effective for overall ginigivitis reduction and 70% more effective for overall plaque reduction! Unbiased? Perhaps. Does this type of comparison study require more? Let’s see how the people at Phillips Sonicare® respond and react to these results. The bottom line? 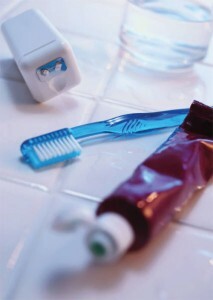 Both Water Flosser and Air Flosser make a huge difference in your overall oral health. The Air Flosser is easier to use and less messy. The Water Flosser is less expensive. I have included the links to the study just incase you would like to read the results for yourself. What is in your soda? Are you having a glass of acid with your lunch??? Click on the link below and find a drink you can enjoy this summer. Try sipping with a lower acidic drink to quench your thirst and keep you out of Dr. Anderson’s dental chair!